Barker, an ex-drummer for the rock band Blink 182 and the star of the MTV reality show Meet the Barkers, had performed at a free Friday-night college event with former Jane's Addiction singer Perry Farrell, Gavin DeGraw and DJ AM. Barker, 32, was taken to a burn center in Augusta, Georgia, about 75 miles southwest of Columbia, and was listed in critical condition Saturday morning - as was DJ AM (real name: Adam Michael Goldstein), 35, say officials at the facility. "Both Travis Barker and Adam Goldstein are in critical but stable condition," Beth Frits, spokesperson for the Joseph M. Still Burn Center, tells PEOPLE. "Goldstein was airlifted here and Barker was brought by ground transportation. So they arrived separately." 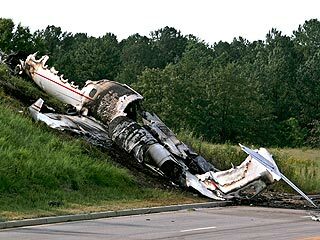 According to South Carolina's Lexington County coroner, Harry Harman, and deputy coroner, Brian Setree, the four others on the plane were killed. They are: pilot Sarah Lemmon, 31, of Anaheim Hills, Calif.; co-pilot James Bland, 52, of Carlsbad, Calif.; security guard Charles Still, 25, of Los Angeles; and Barker's assistant Chris Baker, 29, also of Los Angeles. "We are doing our own investigation as well as waiting to hear what the National Transportation Safety Board has to say," Setree tells PEOPLE. Lynne Douglas, spokesperson for the Columbia Metropolitan Airport, tells PEOPLE the weather was beautiful when the Leerjet left the runway after midnight Friday. "The plane crashed on takeoff and went through a fence near Highway 302, then crossed the road and went up an embankment before being filled with flames," she tells PEOPLE. "There was debris all over the runway. We are closed now and hope to reopen later today." Federal Aviation Administration spokeswoman Kathleen Bergen said the Lear 60 - bound for Van Nuys, Calif., with six people aboard - departed shortly before midnight Friday, when air-traffic controllers reported seeing sparks. Barker and Goldstein perform together under the name TRVSDJ-AM. Goldstein at one time was the fiancé of Nicole Richie. 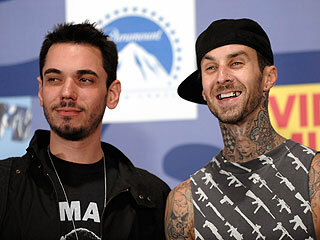 After Blink 182, Barker formed the rock band (+44) and costarred on Meet the Barkers with former Miss USA Shanna Moakler, his wife at the time. Det är hemskt när sånt här händer. Dom hade tur som klarade sig me tanke på att dom andra dog. Får hoppas att dom blir bra snart!